The big news at Ybody USA is our line of aprons! 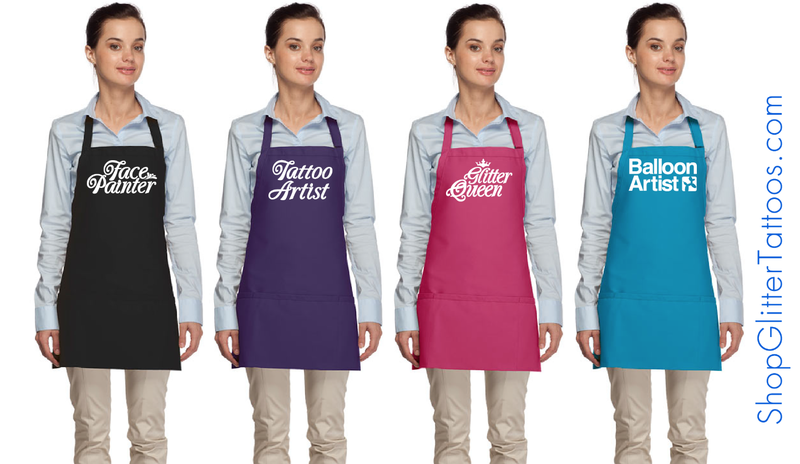 Show up at your Glitter Tattoo, Balloon Twisting or Face painting gig wearing one of our stylish glittery aprons and you are sure to be a hit! These aprons are sturdy and durable, perfect for parties and festivals. You will stand out in a crowd and look professional doing it. The added bonus is that these are manufactured in the USA! Our aprons are the newest addition to our professional wardrobe line. If aprons aren't your thing – make sure you check out our T-shirts. Send us a picture of you in your new apron or T-shirt, we’d love to see you!